eventfulnc | Eventful is a rental company providing unique and repurposed items for special events. What a wonderful day we had for our photo shoot at Bryan Park Enrichment Center. The beautiful outside area allowed us ample space to display a model set up for a wedding ceremony. Our antique pulpit was flanked by tall glass vases on columns. The gorgeous flowers (thank you Tonya of Abba Designs for the beautiful florals!) provided a simple, elegant and colorful backdrop for our ceremony scene. Eventful was, in part, started because we realized that so many brides desire to utilize the God-provided beauty of creation for their ceremony. These same brides often need appropriate backdrops for their outdoor events. 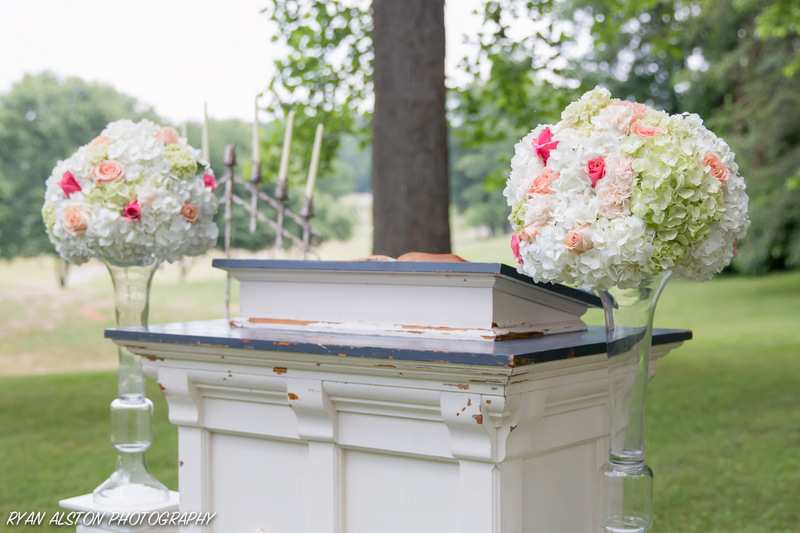 When we saw the pulpit pictured above in an antique store last fall, we knew this was a must-have for outdoor brides. Not only would this well-loved pulpit be a unique altar for a ceremony, but it would be perfect for a sign-in/registry table as guests enter! The pair of rustic candelabras provided a perfect compliment to this pulpit scene. 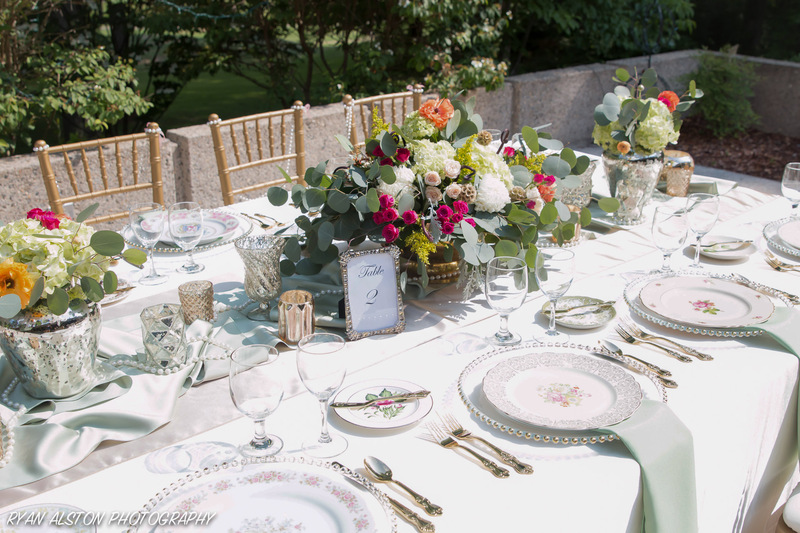 Our mercury glass collection and some of our 200+ collection of mis-matched vintage china made a gorgeous table setting. Jawana of Oniée’s Engagements did a wonderful job with the chosen colors for our shoot. The vintage china and mercury glass on the soft green and gold accents would be a perfect theme for any spring bride. We love the mixture of silver and gold, antique and trendy, that Jawana styled for this shoot. Whether an event is outside or inside, Eventful believes that many more people will come to appreciate not just vintage pieces, but the mixture of vintage with new pieces. Our antique pieces are perfect for brides hoping to combine the charm of the past with modern day trends.